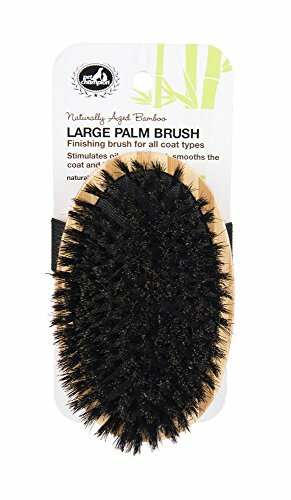 The Pet Champion Large Bamboo All Natural Bristle Palm Pet Brush is perfect for all types of pets. Sometimes called the "Petting Brush", this brush simulates petting and increases interactivity with your pet. Designed to smooth the coat while also giving your pet a rejuvenating massage. This massage helps prevent dry skin, stimulate the oil glands, and distribute oils throughout the coat for a silkier, softer coat. Pet Champion Large Bamboo All Natural Bristle Palm Pet Brush is made from 100% bamboo and features all natural bristles. This Pet Champion Bamboo brush measures 6 inches L x 4 inches W. Check out all the Pet Champion pet items including Leashes, Collars, Carriers, and Toys on Amazon! If you have any questions about this product by Pet Champion, contact us by completing and submitting the form below. If you are looking for a specif part number, please include it with your message.